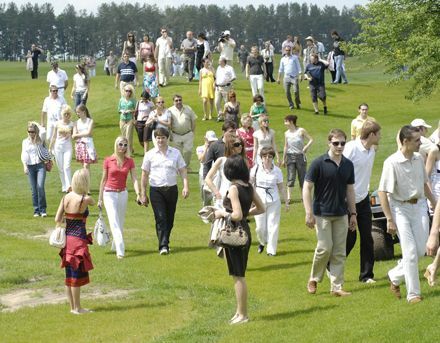 On June 14, 2008 there was the second planned presentation of Kiev Golf Club. A week before this event the Club was introduced to public officials of Ukraine, diplomatic corps representatives, international missions and organizations and to trade representative offices. The news on this unique and unprecedented series of events ran around the high world of Ukraine. Namely, honoured and the most known representatives of that level composed the main part of guests during the given presentation, which organizers nominally called “glamorous”. Selection of presentation co-organizers such as “High Life” TV Project and Katerina Osadcha in the role of a facilitator matched the above. About 300 people visited the event, which surpassed expectations of the organizers. Many press and TV men attended it too. It must be said that there was one more condition that defines a presentation style. On the eve of Paul McCartney`s concert on the same night in Kiev, a thread of English “flavour” and British classical culture was interwoven into the happening on Golf Club territory. At the entrance, by a green track, musicians in traditional folk clothing met guests with bag-pipes music. Quick summer rain brought coolness and gradually gave way to the sun. Good jazz by “Apple Tea” band and facilitator Alexey Kogan, gorodki and tennis by the entrance to the presentation zone, “exotic” petanque a bit aside from a spacious tent for guests, all that created a necessary environment, to be more specific -- organic atmosphere of rest. Morten Norraquard, Head Manager to GolfStream Project, Chief Consultant on golf course construction from Sweden, took part in the official section of the presentation. As a special element, the agenda for “the high life” presentation of the Club included a fashion show on the theme of a golf style from Victor Anisimov. It was done on a carpet podium that imitated a fragment of a green field. And exquisite cuisine from Jurgen Smaglik, Head Consultant for restaurant facility in GolfStream, is an integral element of current and future Club presentations. It served as a good addition to attention and care, paid both to adults and children, who plaid on their privileged games zone. There was one more distinctive feature of this Saturday event. Those who wanted to test golf in a game and in real playing time had an opportunity both to take part in a tour through Park Course (one of three future Golf Club courses, which is ready to receive the first tournament on July 12, 2008) and to try their hand at an additional Driving Range. It will be used in that capacity at least one more month, while grass is growing on a vast training zone of Golf Academy, which is near the Park course and general construction of which is finished. In future it will serve for holding children competitions “Green Team” and for entertainment of guests. Alexey Sokolov, Golf Director for the Project, gave an illustrative lecture on golf rules, different types and ways of hitting. For more than an hour guests, namely versed players, amateurs and kids, who just began to master a new skill with particular enthusiasm, were testing their power and distance of how far they stroke a ball. Winners of an improvised mini tournament got month tickets to attend Kiev Golf Club and, which is a sort of a grand prize, a year subscription. The second drawing, which promises to become traditional during Club’s events, took place among the guests who filled presentation participation forms. This time each prize winner was invited to take a ride through Park Course in a club car together with the management, who gave an additional and more extensive tour to them. Thus, the second presentation was designed as an alternative to the first one held on June 7, 2008. It became a less official and different in stylistic approach event. However, the objectives were the same and in line with an all summer chain of presentations by Kiev Golf Club. GolfStream invites to close socializing those people, who are interested in golf and love it, who want to enrich their life with new experiences, demanding and achieving the best and highest summit in it.